Visit the beautiful cities of Rome, Florence and Venice by train. This independent package gives you the ease of rail tickets and the safety of pre-booked 3- or 4-star accommodation, located close to the station in each city. This tour includes a 3-hour walking tour in Rome, 2-hour walking tour in Florence and a 90-minute walking tour in Venice. Additional city tours and night’s accommodation may be booked on request. Breakfast at the hotel. In the morning enjoy an orientation tour of the Rome city center. 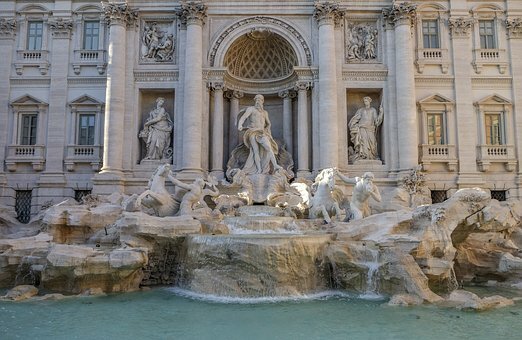 Reach the meeting point of the tour 15 minutes prior to the departure (hotel pick up is not provided) and enjoy a 3-hour walking tour including Campo dei Fiori, Piazza Navona, Pantheon, Trevi Fountain and Spanish Steps. Rest of the day at leisure. Optional afternoon / night sightseeing tours are available. Breakfast at hotel and day at leisure. Optional tours in the city or to Naples and Pompeii are available. Breakfast at the hotel and independent transfer to the Rome rail station where you will board your high-speed train to Florence. Upon arrival in Florence, transfer on your own to the hotel. Rest of the day at leisure, optional afternoon / night sightseeing tours are available. Breakfast at the hotel. In the morning enjoy an orientation tour of the Florence city center. Reach the meeting point of the tour 15 minutes prior to the departure (pick-up from hotel not provided) and enjoy 2 hours walking tour including the Duomo, Baptistry, Giotto Bell Tower, Piazza della Signoria and Palazzo Vecchio. Rest of the day at leisure. Optional afternoon / night sightseeing tours are available. Breakfast at the hotel and independent transfer to the Florence rail station where you will board your high-speed train to Venice. Upon arrival in Venice, transfer on your own to the hotel. Rest of the day at leisure, optional afternoon / night sightseeing tours are available. Breakfast at the hotel. In the morning enjoy an orientation tour of the Venice city Centre. Reach the meeting point of the tour 15 minutes prior to the departure (pick-up from hotel not provided) and enjoy a 1 hour 30 min. walking tour including Piazza San Marco with its Basilica, Clock Tower and Palazzo Ducale. Rest of the day at leisure. Optional afternoon / night sightseeing tours or gondola ride are available. Transfers from the hotel to the train station / train station to hotel except on Day 1.